Tamale House East at Gettin' Sauced! With great pleasure, I announce that we will have a tamale vendor at this year's Gettin' Sauced! We've never had a tamale vendor, so we're excited to give festival attendees something new. We're also glad that the vendor is from right here in Austin. So, without further ado, this year's (first-ever) exclusive Gettin' Sauced! tamale vendor is Tamale House East (1707 E. 6th St.)! 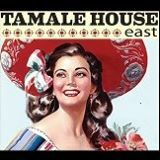 Be sure to stop by and snag some tamales, & check out Tamale House East on Facebook & Twitter! And, if you're free tonight at 7, they have a Vietnamese pop-up event at their restaurant! COLLEGE FOOTBALL IS BACK!!! If you're like I am, you're pretty excited this weekend. Also, if you're like I am, you like Texas BBQ and free stuff. So, put all of those together, and what you have is our Gameday Giveaway. Well, jump on it. To submit, leave a comment below this post, email me, or submit via Twitter or Facebook. 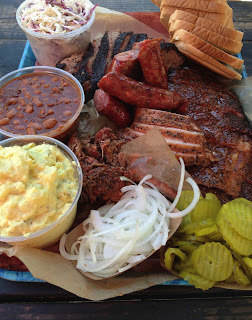 Our sincerest thanks to la Barbecue, whose generosity makes this giveaway possible! Where's the SECOND best BBQ in the Big 12? FINALLY! College football resumes today. All is right in the world again. In a nod to my surroundings, I turn today not to my beloved Alabama Crimson Tide and the Southeastern Conference. Rather, I'll make today's Question of the Day about the Big 12. 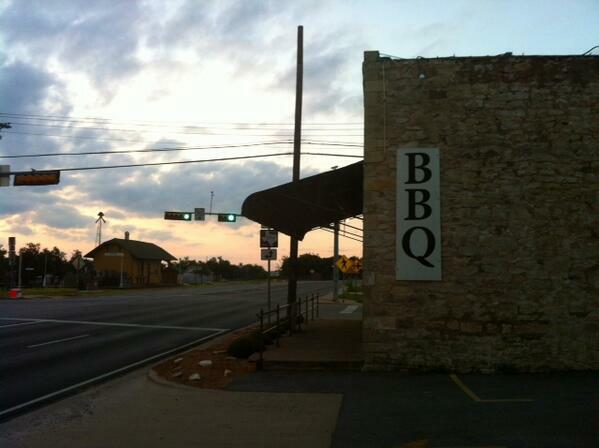 I presume that most of my readership would say that, of all the campus towns in the Big 12, Austin has the best BBQ. By all means, if you disagree, let me know. 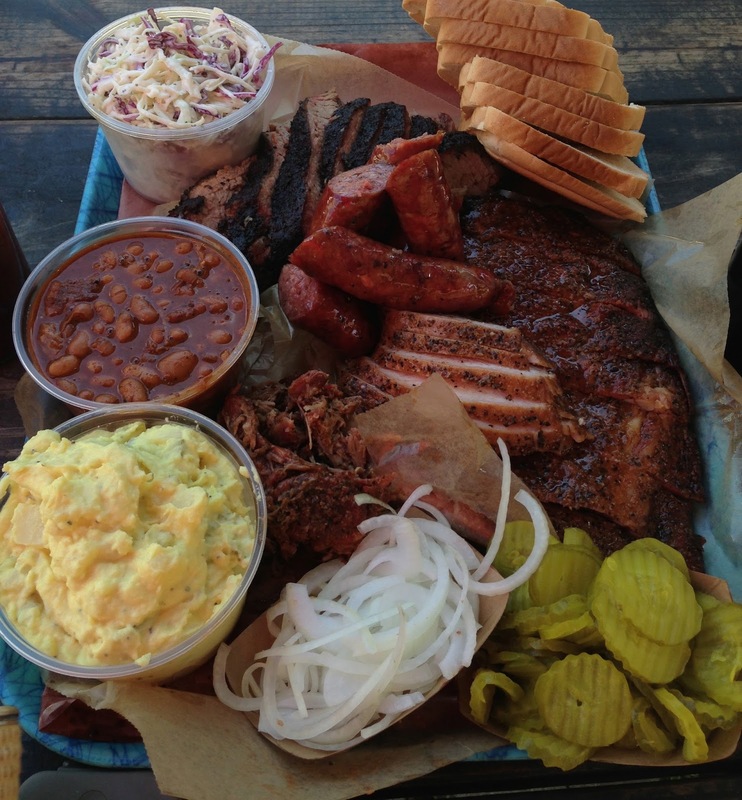 But for the rest of you, my question is this: Which campus town has the SECOND best BBQ in the Big 12? 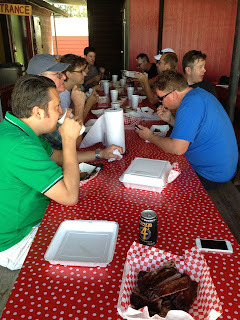 Rest of the pics from our recent private Texas Q Tours trip stop at Opie's Barbecue (Spicewood, TX). Just a couple of the many orders in our group: half chicken, sweet-&-spicy baby backs, pork ribs, spicy corn, tater-tot casserole, & banana pudding. Yesterday morning, I flew into Los Angeles to spend a few days. There are some Texas-style BBQ joints in the area, but as most of you know, California's brand of BBQ is tri-tip beef, known as Santa Maria style. 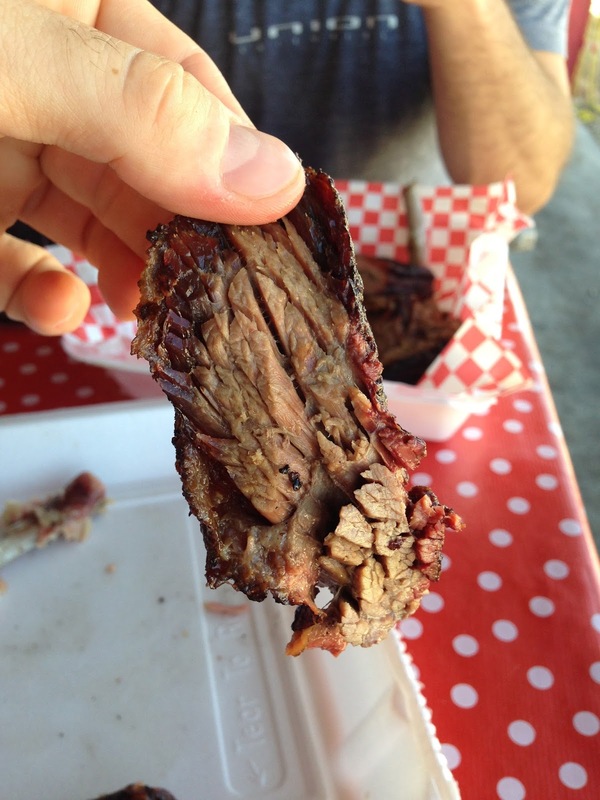 So, I'm curious what the non-CA folks think about tri-tip. Where have you tried it? What did you think about it? Have you ever cooked it yourself? If so, how? So, basically open forum today on tri-tip. I'll be happy if I get one comment! Everyone (including us in this) always asks for favorites, the best, etc. But what if your favorite BBQ joint is closed? What if you don't have time to get across town and grab a bite? What if you do have time to get across town to grab a bite, but when you get there, the line is too long or they're sold out? What then? You have a backup plan, right? So, what is it? What's your go-to spot when you're go-to spot doesn't pan out? Win a year of All-Star Sauces! BBQSauceReviews.com, one of our wonderful Gettin' Sauced! sponsors, is running a great giveaway today: a year membership of All-Star Sauces!!! That's 12 bottles of award-/contest-winning BBQ sauces, shipped right to your door. FOR FREE!!! For all the details, click here. 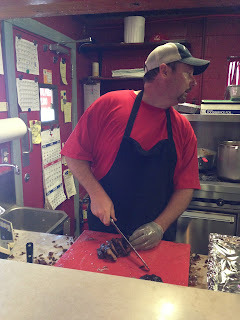 And be sure to follow BBQ Sauce Reviews on Facebook & Twitter! 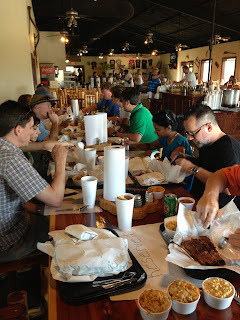 The first BBQ stop of a private Texas Q Tours trip back in July was Cranky Frank's Barbeque Company (Fredericksburg, TX). When we arrived, our group settled in at picnic tables outside, while I rounded up brisket, pork ribs, & sausage inside. 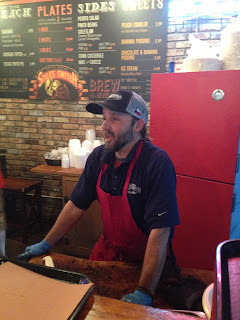 Below, proprietor & pitmaster Dan Martin on the cutting board. More pics from this stop to come. QOTD: Top 5 sides in Texas? Yesterday, I asked which Texas BBQ joint serves the best slaw. On Twitter, the replies turned into a broader discussion about sides, in general. One of the responses sparked today's QOTD: Of all the side items at Texas BBQ joints, what are your 5 favorites? 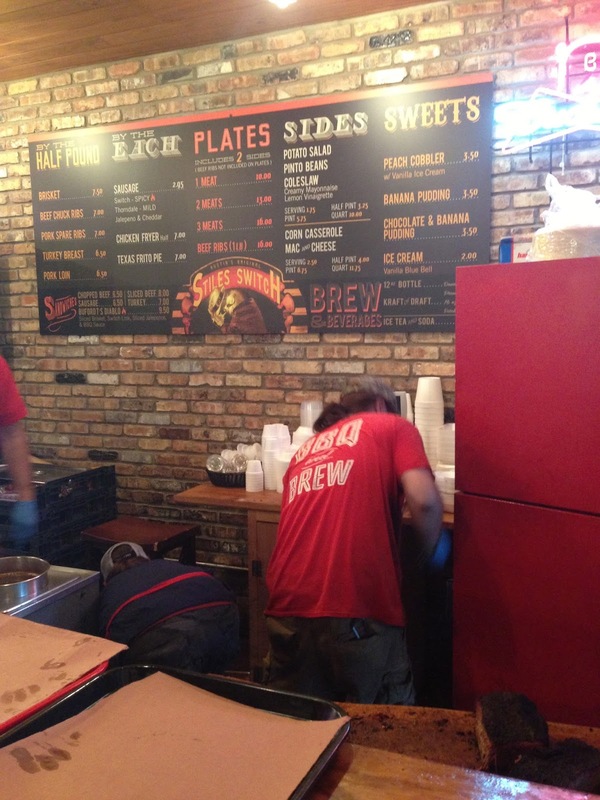 QOTD: Which Texas BBQ joint serves the best slaw? 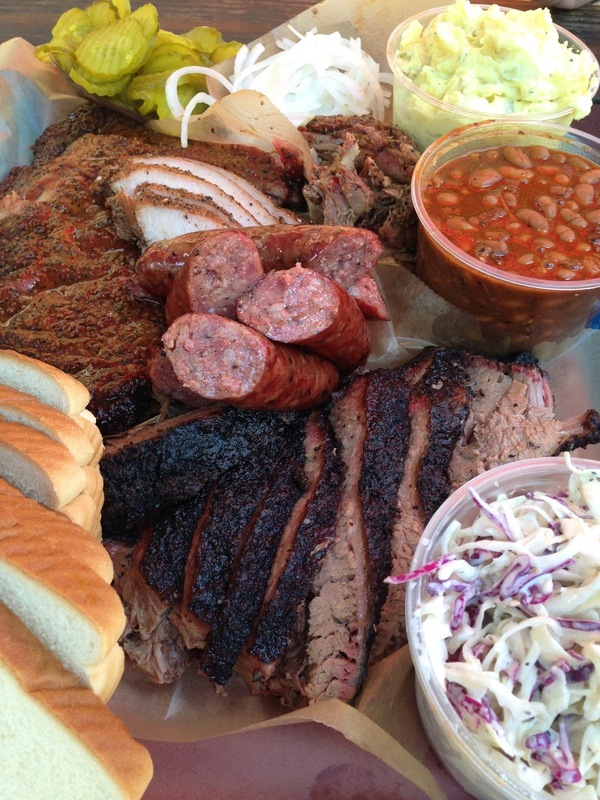 Simple QOTD today: Which Texas BBQ joint makes the best slaw? Feel free to break your answer down into mayonnaise- versus vinegar-based slaw, non-committal types. 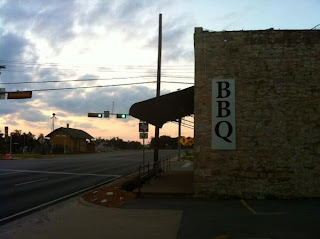 Blog: "A Corkycue weekend in Texas Hill Country"
"Texas Hill Country. 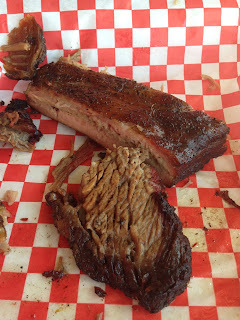 Beef and pork, brisket and ribs. Undulating landscape, green and brown, and blue skies full of cotton-white clouds. A van full of people hailing mostly from Texas, with some Canadians, a Colombian, and me thrown in. Political leanings vary, though Democrats (Liberals) outnumber those of less lofty persuasion, and when the conversation turns to the Trayvon Martin/Zimmerman trial and women’s reproductive rights the van suddenly becomes a rolling (and roiling) marketplace of ideas." Thanks for the post, James! Time for some fantasy football! UPDATE: THE LEAGUE IS FULL. 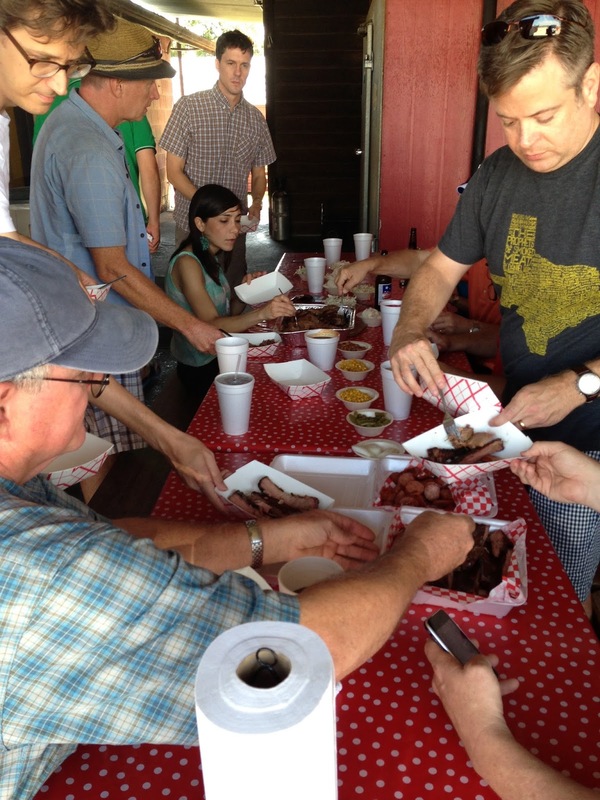 At which Texas BBQ joint was biggest gap between best meal & worst meal? Consistency is a real test for any Texas BBQ joint that doesn't automate the cooking process. 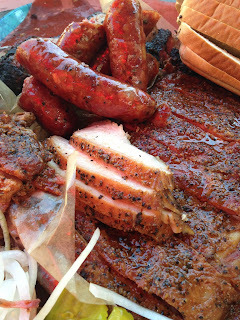 Managing of the elements that affect how pit-/smoker-cooked BBQ turns out requires practice and skill. Sometimes, though, even the best places can have a bad day. 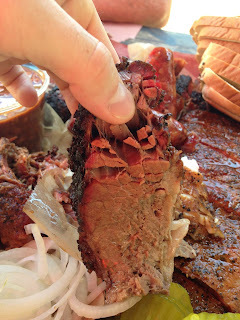 Of all the BBQ joints you've visited more than once, at which one have you seen the largest gap b/w a good day and a bad day? In other words, which place had the biggest difference in quality/taste between your best meal there and your worst meal there? 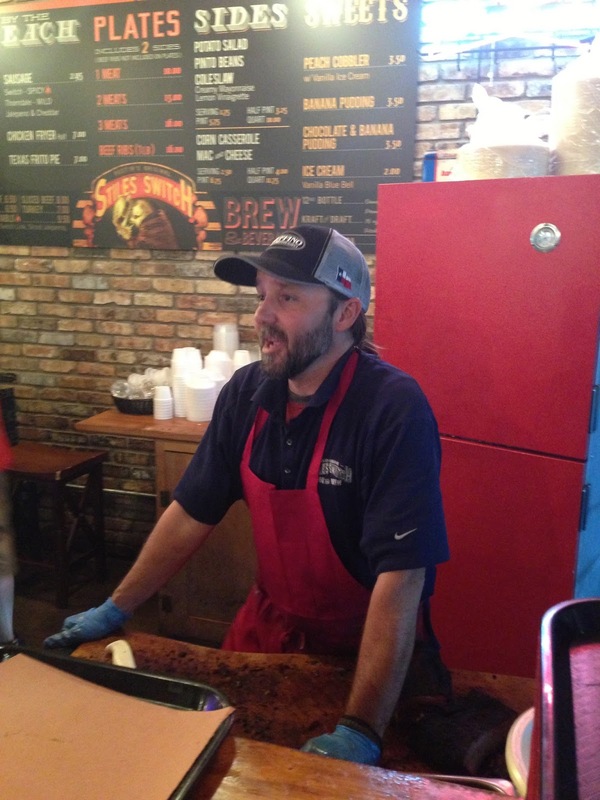 Had lunch last week at Stiles Switch (Austin) with a fellow Man Upper. On our table: beef rib, pork rib (not pictured), half chicken, lemon-vinaigrette slaw, & corn casserole. Pitmaster Lance Kirkpatrick pictured second from bottom. 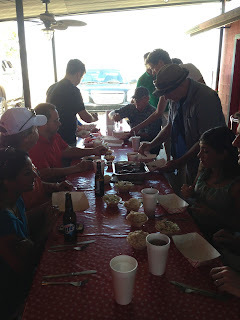 Discounts on private Texas Q Tours trips! We like to have a public Texas Q Tours trip every other month. We just had 1 Saturday, but with Gettin' Sauced! coming up Sept 28, football season to compete with, and the holidays, it's possible we won't have another public trip in 2013. Not to fear, because we're always here for private tours. You tell us what you want, and if we have availability, we price the trip and go from there. Family outings, office team building, bachelor/bachelorette parties, friend reunions, etc. 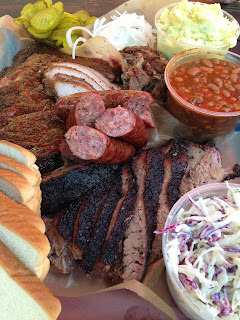 BBQ joints, wineries, breweries, distilleries, landmarks, attractions, etc. We're here to customize a trip just for you. As an accommodation for what might be a few months without a public tour, today I announce some discounts for private tours! For availability & pricing, email us! 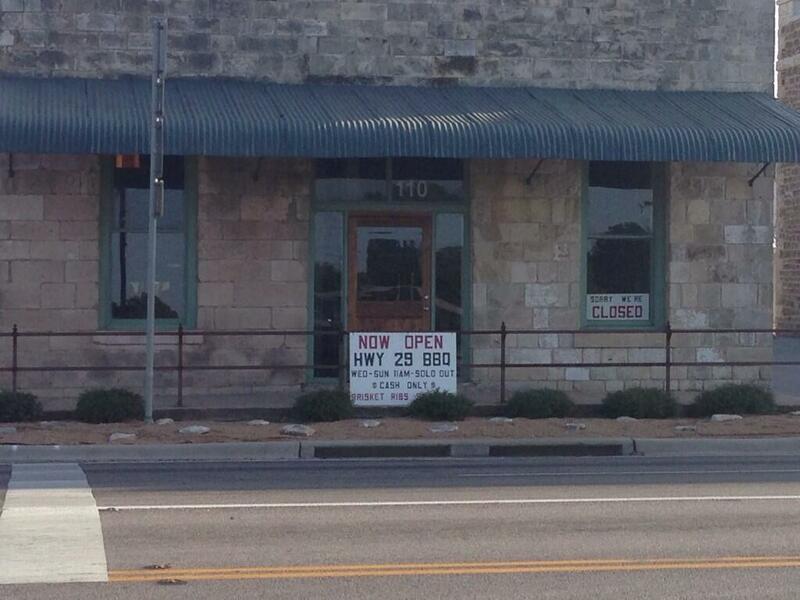 Via Twitter, I learned Saturday that Hwy 29 BBQ has opened in Bertram. Here are a couple of pics that they've tweeted. 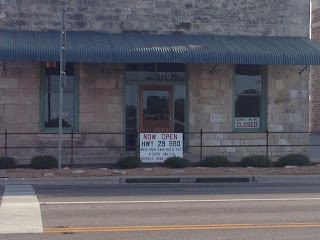 Located at 110 West Hwy 29. Open Wed-Sun, from 11AM until they sell out. For more pics and info, check out their Twitter page. No website.